Handling and storage of large quantities of materials is crucial to the chemical engineering of a wide variety of products. Process Equipment Design explores in great detail the design and construction of the containers – or vessels – required to perform any given task within this field. The book provides an introduction to the factors that influence the design of vessels and the various types of vessels, which are typically classified according to their geometry. The text then delves into design and other considerations for the construction of each type of vessel, providing in the process a complete overview of process equipment design. 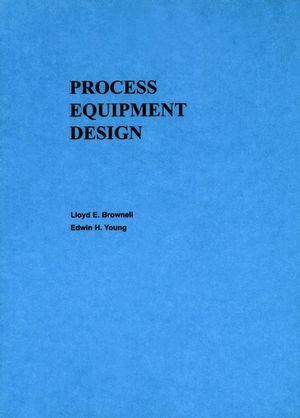 Lloyd E. Brownell and Edwin H. Young are the authors of Process Equipment Design: Vessel Design , published by Wiley. Factors Influencing the Design of Vessels. Design of Shells for Flat-Bottomed Cylindrical Vessels. Design of Bottoms and Roofs for Flat-Bottomed CylindricalVessels. Proportioning and Head Selection for Cylindrical Vessels withFormed Closures. Stress Considerations in the Selection of Flat-Plate and ConicalClosures for Cylindrical Vessels. Stress Considerations in the Selection of Elliptical,Torispherical, and Hemispherical Dished Closures for CylindricalVessels. Design of Cylindrical Vessels with Formed Closures Operating underExternal Pressure. Design of Tall Vertical Vessels. Design of Supports for Vertical Vessels. Design of Horizontal Vessels with Saddle Supports. Design of Pressure Vessels to Code Specifications.